my Tele has new life!!! Dave, Please consider posting on your website, after playing the same old same old. I did some research and came across your website, I was in search of a new sound for one of my Tele''s. Through the magic of you tube and various other outlets, I found some sound clips of your pickups. WOW....... is an understatement, I called up your shop on Thursday and Friday I had pickups in hand. Overnight shipping was imperative my Tele has new life!!! 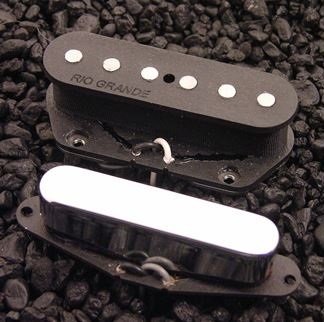 I own several guitars with various pickups, but it's a done deal Rio Grande will be in every guitar that I own. Truly amazed at the sustain and tone that comes from this matched set of single coils. When that being said, I am not a professional musician by any stretch of the imagination. But with your pickups I am determined to play as hard as I can, and my playing will improve. Now here is what I am most pleased with, customer service you see folks, when I called I spoke to a person on the other end of the phone, who truly cared about me. I know that my business is valued, and I will do my part in offering perhaps the best form of advertising, word of mouth. So make no mistake the Rio Grande pickup line is by far the best pickup you can buy, no doubt! I look forward to hearing some new sounds from my guitars, and tones that will amaze. Thanks for all you do!! !